Made in the USA of 100% wool with jute backing by Bloomsburg carpets, the Lisa Slayman signature carpet line continues our commitment to the use of top-quality materials. The beautiful carpets in our line have also been certified GREEN LABEL PLUS, the higher standard for indoor air quality. 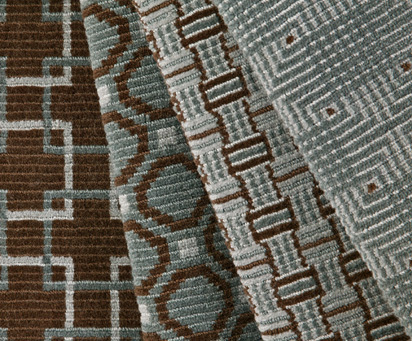 Full pitch Wilton weave, using a fine Italian denier yarn count, each with three frames of color, and a face weight of 55oz, these four patterns created in six color variations offer carpets of distinction and elegance. Patterns shown from left to right are Box Step, Tango, Fox Trot and Choo Choo Boogie.